Here is the most comprehensive collection I believe exists of variations on the 2mm pinfire cartridge. A lot of people I talk to do not even know that there is more than one variation; especially those with who collect the 2mm pinfire guns. Descriptions of each picture are immediately under the picture. This is the 2mm Xythos pinfire blank. It is made by ADK (Andres & Dworsky of Karlstein, Austria.) This is the newer style cartridge and to my knowledge, ADK is the only company still producing pinfires. 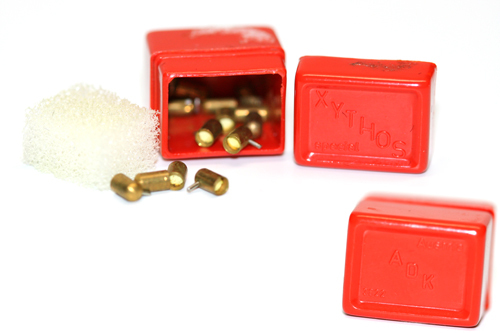 It has a rounded base and is made specifically for the Berloque Xythos pinfire revolvers. These guns often have a 9mm flare shooter that attaches to the end of the barrel. They are sold as novelties and for hikers to be able to carry a very small flare launcher. They have a yellow wad near the top of the case. 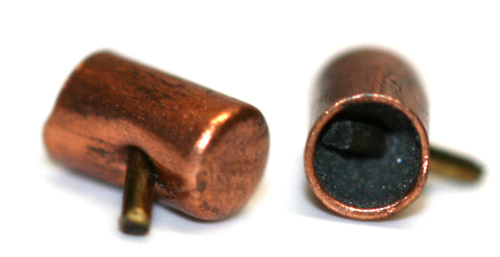 They have more gun powder than most of the other blanks to ensure the flare ignites if the flare attachment is on. They also seem to have a louder report from they few others I have tried. 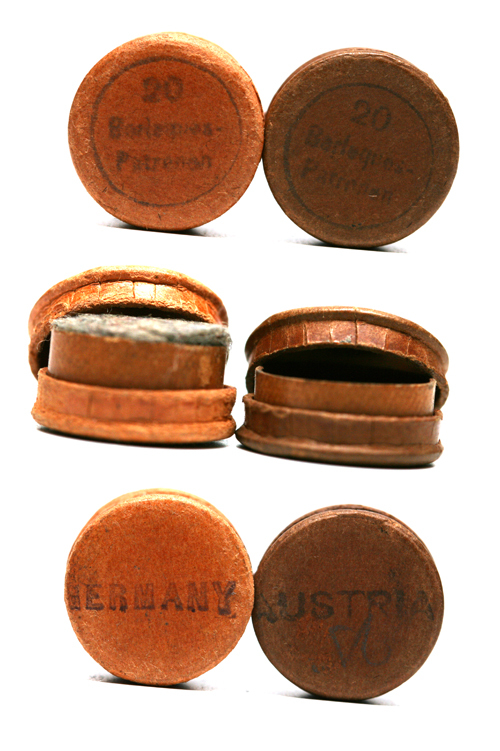 These are similar to the Xythos blanks but do not have quite as dramatically rounded base. These samples are probably hand loaded and not factory loaded with a cylindrical piece of lead (kind of like a wadcutter.) Made in Germany. these have a slightly rounded base, but not so round where they will not stand up like the last two. They have a very shiny silvery wad halfway down the case. These have a tan wad 3/4 of the way up the case. These all have a very noticeably different base that protrudes slightly to a point as if they were lathe turned. I believe these are factory dummies, but they could just be mistakes. 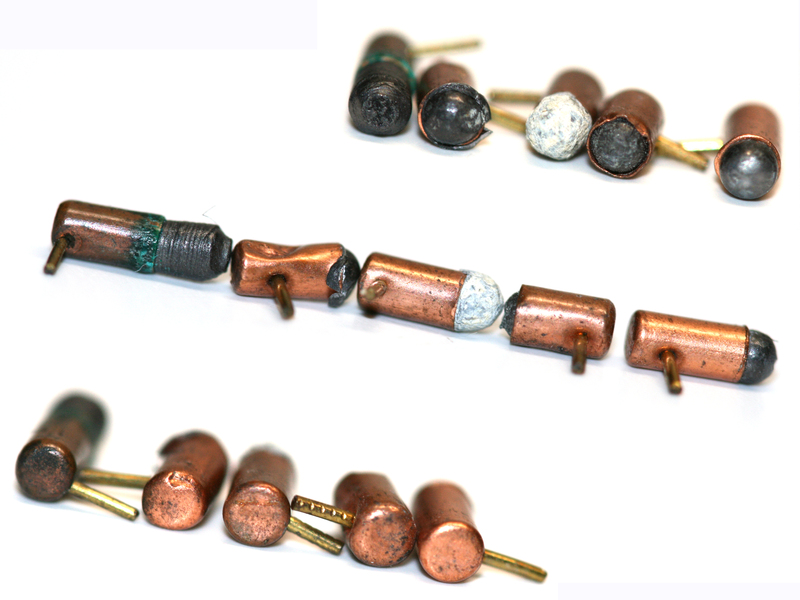 These are all homemade ball cartridges with #9 shot shoved in a blank cartridge. Notice that the ball is either slightly too big and hangs over the rim of the cartridge, or pushes the cartridge case outward when shoved in. 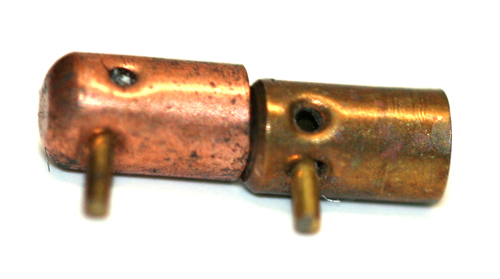 The previous picture is a homemade shot cartridge. 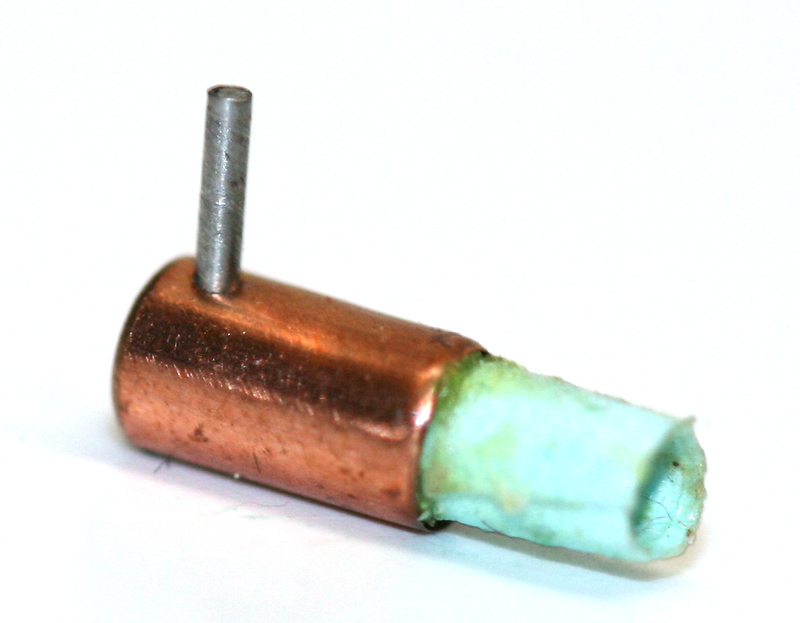 This is the only variety of a genuine factory loaded 2mm cartridge that I think exists. 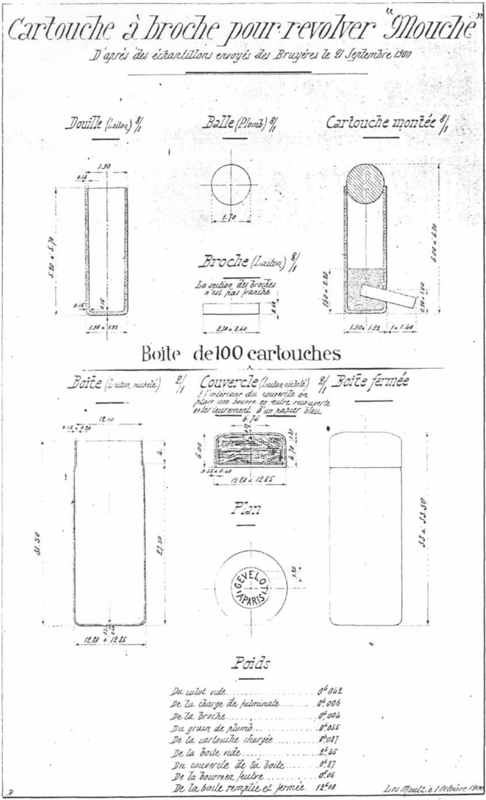 (I would LOVE to be proved wrong on this though as I would like more official live variations) Below are its specifications from an SFM(Societe Francaise des Munitions) Factory Drawing dated September 1900. It shows their specifications for their cartridge for the antique "Pistolet-Mouche" revolver. 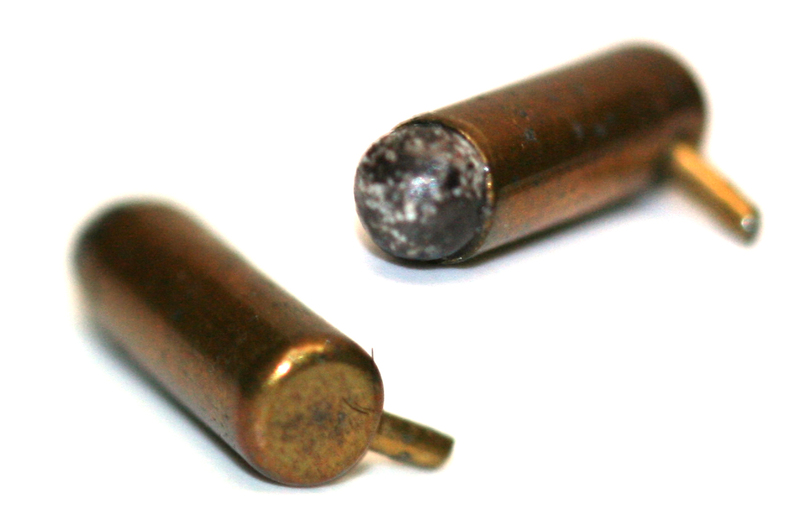 Notice too that the diameter of the cartridge is slightly smaller at 1.9mm than most 2mm cartridges which are normally right over 2mm in diameter. Also, notice that the ball is 1.7mm. 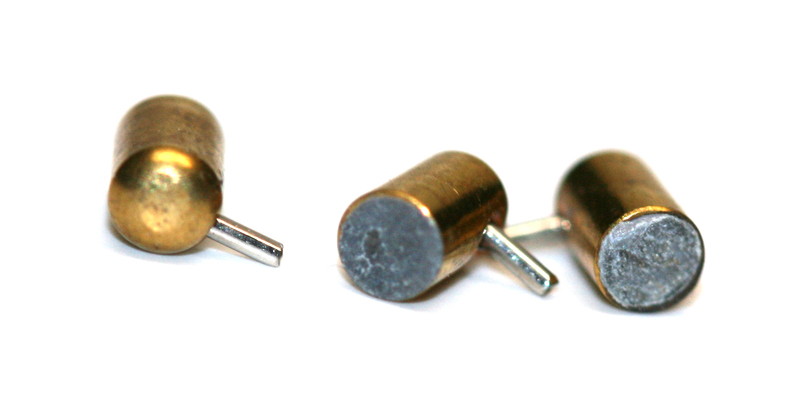 The #9 shot shoved into blank cartridges that most people find and think is a live cartridge is 2.03mm. Internal SFM factory drawing discussed under previous picture. 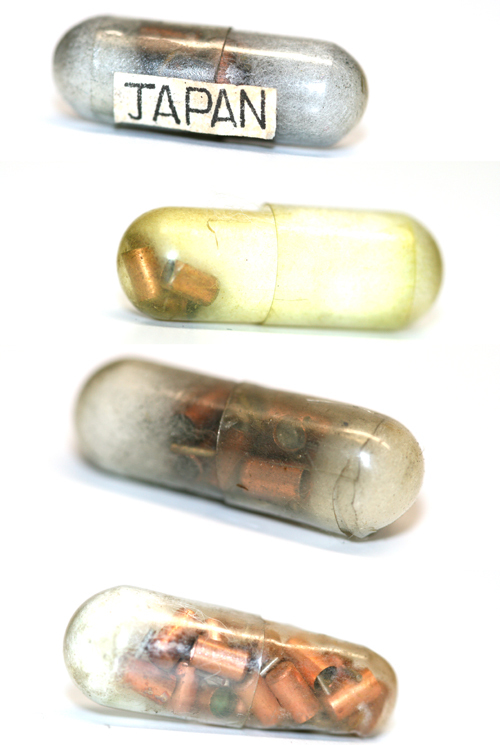 Variations of some capsules the 2mm pinfire cartridges came in. Variations of some boxes the 2mm pinfire cartridges came in. Box the 2mm Xythos pinfire cartridges by ADK come in.